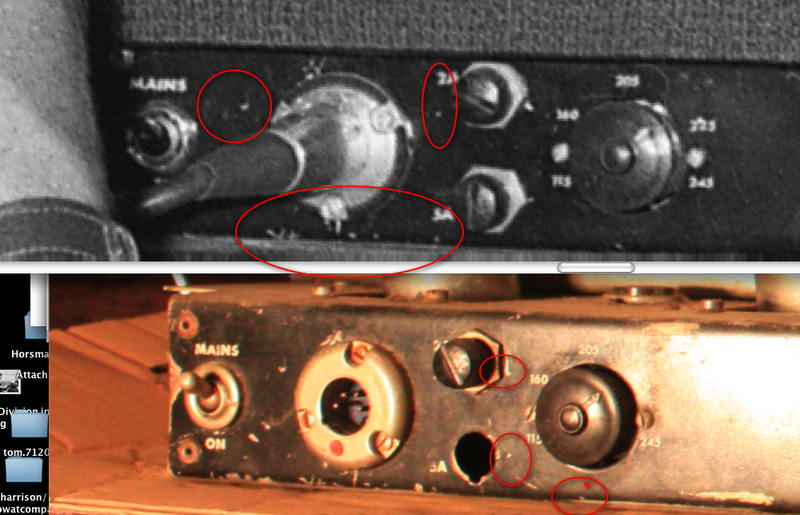 To kick things off, here are some photos of the left side of the panel, with some of the more obvious points circled. 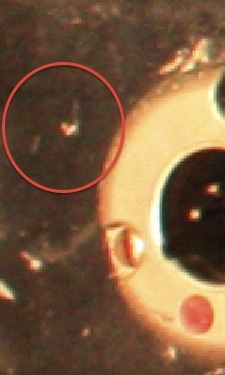 Some of these marks are caused by hard scratches/knocks which chip away the enamel to reveal the bare underlying metal. Some shapes are less visible in some head-on photos, but heightened by certain angles/lighting. 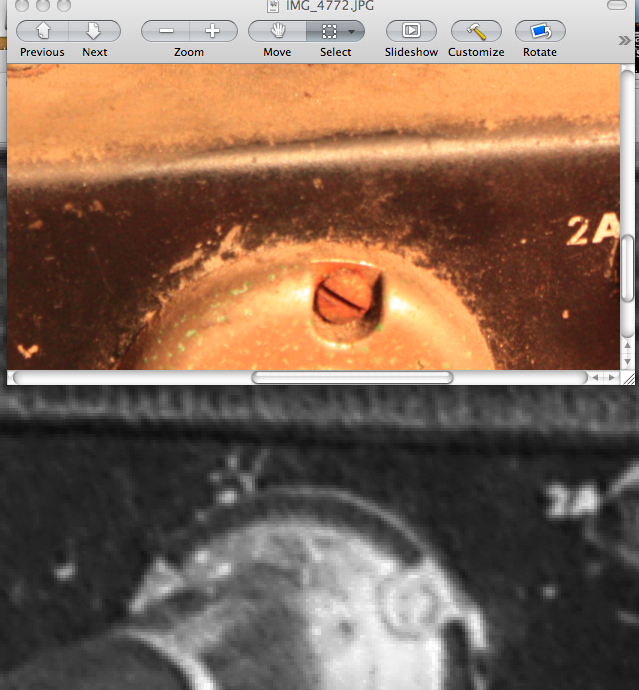 This suggests radiating impact damage/fracture of the enamel, just under the surface. Moving towards the middle of the rear panel, we have the Standby switch. 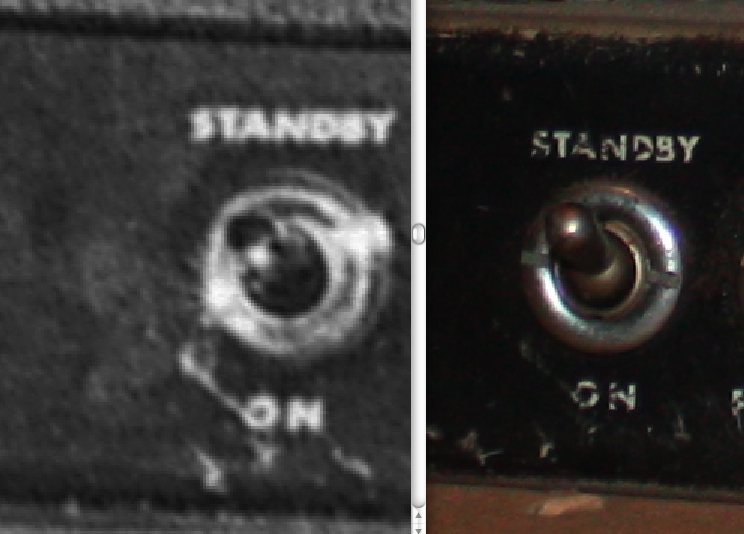 1966 b/w amp left © Beatles Book Photo Library, Swiss amp right. Here are the marks under the Standby switch. Note how some blow has scratched, possibly taking a chip out of the top left of the ‘O’ of the ‘ON’ legend. We’re at the extremes of even this highly detailed image, but there’s a slight suggestion in the 1966 photo of similar damage, probably from whatever caused the scratch. The switches today have been changed over to metal; we suspect that this was done in-house by Triumph. Maybe after damage during the tour, it was returned or recalled for a make-over back in Croydon, rather as Carl Nielsen recalled switching a blown transformer on one of the Beatles models that been similarly returned to Triumph. On the right side of the rear panel, we have the marks under the footswitch. Though screws and bolts seem to have been tightened here and there over the years, several remain in the same position. 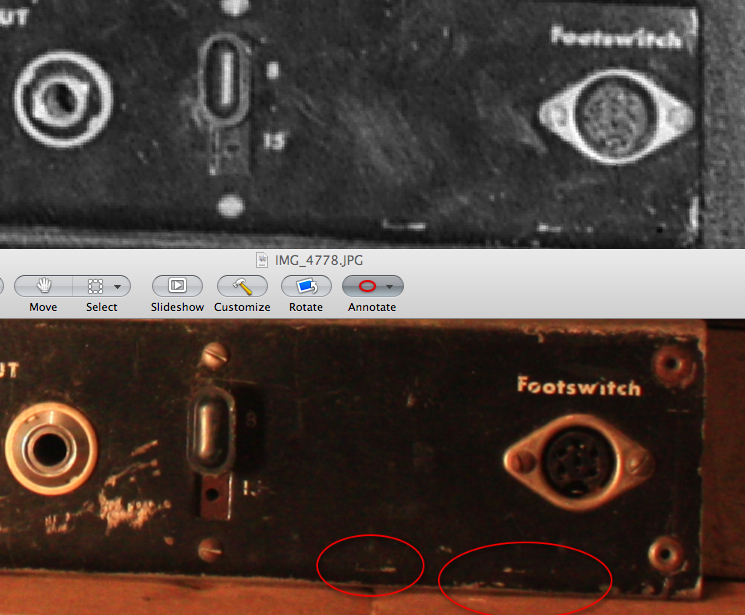 Here the footswitch screws in the corner look to be the same, but the ones on the ohm selector look to have shifted. The may have been tightened when it was given an overhaul, or loosened in all the travel by train/plane/car on tour. 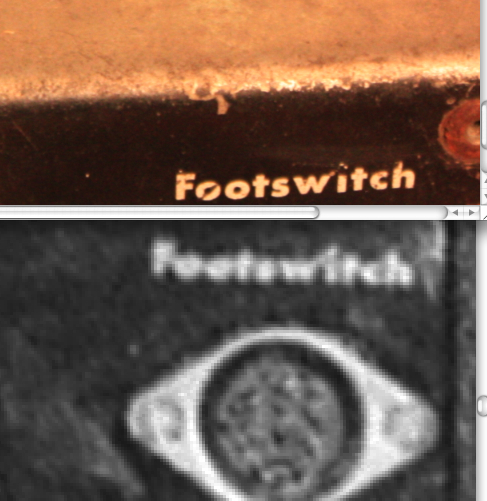 On the Footswitch legend itself, you can see what looks like a flaw/blemish dot just beyond the top right of the W. Again the image is too blurry to say for sure what’s there, but there does seem to be something reflecting beyond the top right of the W in the 1966 Beatles panel too. (Although the F is slightly high on both, this seems to have just been from the stencil used. It turned up on another amp with prototype features, so we don’t think the high F is any kind of distinguishing mark. That’s not the case though with this dot shown here, beyond the last upstroke of the ‘W’). More photos & comparisons to follow…..